By Bob Lotich 13 Comments - The content of this website often contains affiliate links and I may be compensated if you buy through those links (at no cost to you!). Learn more about how we make money. Last edited March 2, 2013 . 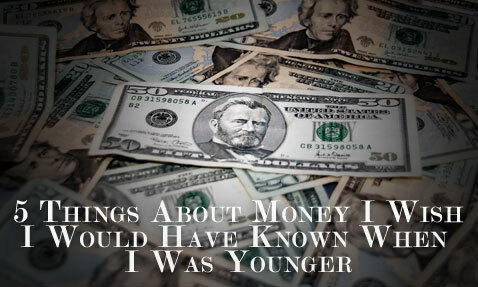 Many of us may feel that we can never quite catch up with our money, but one thing is certain: There are many things about money that we probably wish we had known when we were younger. For those of you who are still young or even young at heart, here are five things about money that you should probably think about. If you can save money at a young age and invest it in a quality mutual fund, you can become a millionaire by the age of 58 with only a small investment. That’s the beauty of compound interest. Consider this scenario: Beginning at the age of 19, Jane invests $2000 per year ($167 per month) into a mutual fund with a 12% rate of return. She continues to invest $2000 per year into that same fund until she reaches the age of 26. From the age of 27 on, she invests nothing. This gives her a total out-of-pocket investment of $16,000. By the time she is 58, her $16,000 investment will have turned into $1,035,425! It can be difficult to find a fund consistently earning 12%, but even if it is only 10% the power of compound interest still works quite well! A monthly budget is the single most powerful tool you can use to keep tabs on your money. If you aren’t able to see where your money is going each month, you’ll have no way of knowing where you’re overspending or where you need to change your spending habits. Remember what we said about compound interest? Well, credit card companies love compound interest. In fact, many of these companies charge interest rates of over 18%. Pretty good return on the money they’re loaning out, isn’t it? The single biggest problem with credit cards is that when you max out the card and only make minimum payments, it will take you forever to pay off the card and the interest that you pay will be much higher than what you originally owed. Even the best credit card rewards don't make up for all the interest paid if you are paying monthly miniums. Instead use a cashback debit card like Perkstreet Financial which pays just about as much as any credit card rewards. If you budget your money and set specific goals, you’ll be able to use cash for all of your purchases. If you use cash for big-ticket items, you have bargaining power. Most people in the U.S. are afraid to bargain with retailers. Doesn’t it seem strange that when you travel to almost any other country in the world, marketers actually expect you to dicker? When you bring cash into the store it does a couple of things. First, using cash gives you a sense of the value of the item. It’s much harder to part with the dollars than it is to just put it on a credit card. Guess what? Retailers know this. People who use credit cards for purchases are much more likely to buy more. Basically, it doesn’t hurt as much when you use a card. When you count out that cash to pay for an item, it’s kind of like saying good-bye to a good friend. Cash enhances your bargaining ability. When the salesperson tells you the price of the item in question, the first thing you can ask is, whether or not you can get a discount for using cash. The answer is usually yes. If it isn’t, you can always go to a store where it is. Using cash also puts a top-end amount that you’re willing to spend. If the item is higher in price than what you have, you can always tell the salesperson that you only have x-amount of dollars. It may take a couple of trips to the manager’s office, but most of the time, you’ll be able to negotiate the price of the item down to what you have. It’s much easier to save money when you’re young. If you’re in your mid or late teens, you probably live with your parents. This means you have no real living expenses. If you have a job, you can put most of your paycheck into savings or investments. Remember what we said about compound interest? Put your money in a quality mutual fund and be ready to retire early. Another reason to start saving early is to establish it as a normal habit. Once you’re out of your parents’ house, it’ll be much harder to save. If you’ve established saving as an important goal, you’ll be much more likely to continue a habit that you’ve started early on. Many of us wish we could have “do overs” in our life. The way we handle money is usually one of them. If you’re still young, begin practicing the items listed above and reap the rewards as you get older. Bob enjoys dark chocolate, paying off debt, giving, Foosball, loose-leaf tea, and helping people succeed. He started ChristianPF in 2007 and Co-Founded Blogging Your Passion in 2011. That was cool to see Bob’s name as the “guest poster”! Amen to the saying, “NO” to credit cards. I fell into the trap of thinking credit cards were there for me to get whatever I wanted, whenever I wanted. Big mistake I wished I would’ve realized before I racked up a bunch of debt! You are so right that it is best to learn these things right out of the shoot. Most of us mess it all up and then have to go back, fix it, and start over. (Sometimes more than once.) These would be excellent dinner time topics to share with your children. Even a small child can have a piggy bank. Start a Roth IRA the year you turn 18. That is something I wish I would have started when I was younger. You can even start one earlier if the child has earned income! Why not start their roth when they get that first job with income reported to the IRS? There is no age limit – just a requirement for earned income! Really?! Dang it! I could have started one when I was 16 then. Man, that is depressing. Love these ideas. My favorite is compound interest. Even though I know how important it is, it still always amazes me when I look at real examples. Being smart with your money can have huge returns down the road. I also wish I would have known “the reasons for taking care of your stuff”. I’m going thru that now with my 3 year old. He doesn’t understand that if you take care of something, it you won’t break as quickly which either means that you won’t have to spend time and money fixing it as quickly, or you won’t have to replace it outright as quickly.